University leaders entered 2017 ready for a bruising session of the Texas Legislature. Budget cuts seemed imminent. Fights over tuition and benefits for military veterans were looming. And the controversial piece of legislation known as the "bathroom bill" threatened to spill over into colleges and universities. But it turned out to be a quiet session, and in many ways the year will be remembered for what happened on campus — not in the Capitol. Here are the top higher education stories of 2017. University leaders knew the 2017 legislative session would be tough. Lawmakers didn't have much money to toss around, and Lt. Gov. Dan Patrick, the Republican leader of the Senate, was angry at colleges and universities for raising tuition in recent years. Still, school officials were alarmed when the first version of the Senate budget included the elimination of a funding category called "special items" — home to about $1 billion worth of programs and initiatives on college campuses. Some schools warned they might have to shut down if the special items were zeroed out as proposed. As a neo-Nazi rally in Charlottesville, Virginia, was descending into chaos in August, local white nationalist Preston Wiginton alerted the media of his own plans for College Station. "TODAY CHARLOTTESVILLE, TOMORROW TEXAS A&M," he wrote in a press release. Wiginton said he'd be holding a rally on the Texas A&M University campus on Sept. 11, an announcement that immediately sparked rage across the state. 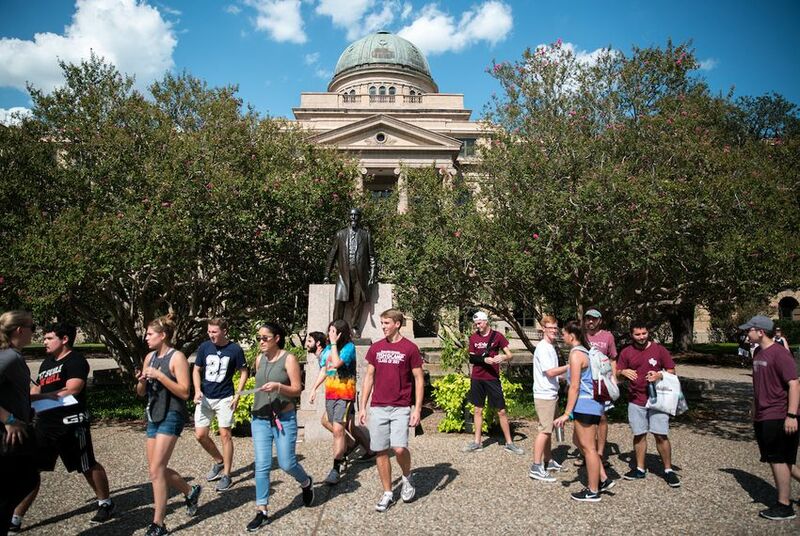 A&M officials had a tough decision: Should they cancel the rally and avoid the risk of violence, or respect the free speech rights of the organizers — no matter the odious views the rally sought to promote? A&M chose to cancel the event. Wiginton threatened to sue but hasn't. The A&M case may have been the most extreme, but nearly every university president in the state had to deal with at least one question of free speech, inclusiveness and respect in 2017. The University of Texas at Austin chose to remove statues honoring Confederate leaders in the middle of the night. The University of Houston renamed a residential hall that shared the name of a defender of slavery. At times, critics wondered whether some schools were going too far in their efforts to protect students from unpopular views. Texas Southern University canceled a commencement speech by Republican U.S. Sen. John Cornyn. The University of North Texas faced similar pressure to halt a fundraising event featuring Donald Trump Jr., but decided to let the event go on. By late 2017, politicians were questioning whether they needed to step in. In 2018, the Senate State Affairs Committee will study the issue of free speech on campus. The most destructive storm in Texas history smashed into the Gulf Coast right around the time classes were set to begin. Colleges and universities across the state delayed their start dates. Schools in Houston saw some of their buildings flood. And a UT-Austin research facility along the coast was practically destroyed. Then, when cleanup time began, Gov. Greg Abbott picked a higher education leader — Texas A&M University System Chancellor John Sharp — to head up the state's rebuilding efforts. His work is expected to last for years. When the 2017 legislative session began, Patrick listed halting tuition increases as one of his top priorities for the year. He got a bill through the Senate to freeze tuition, but the legislation died in the House. Soon after, tuition went up again. Virtually all the major university systems in the state now have plans to impose some sort of tuition increase next school year. Schools say inflation, competition and insufficient per-student state funding are the main causes for the increases. In June, Linda Livingstone became the first female president of Baylor University. She took over while the private Baptist school was still reeling from a 2015 scandal over how it handled allegations of sexual assault against football players. Livingstone vowed to help the school move past the scandal. But as the year progressed, it kept resurfacing. The reason? Jim Dunnam, a lawyer, former state representative and alumnus of Baylor who is helping several women sue the school. His filings in federal court turned up several damning stories, including one in which a former chairman of Baylor's board of regents called female students who drank at an off-campus party "perverted little tarts." Dunnam is in the process of obtaining thousands of records from Baylor for the case. If a settlement isn't reached, a trial could begin in 2018. Chancellor Bill McRaven was hailed as a hero when he took the helm of the University of Texas System — after all, the retired Navy admiral had overseen the raid that killed Osama bin Laden. But in 2017, he began to face heightened scrutiny from the board that hired him. Regents questioned spending and staffing levels at the system headquarters. They axed McRaven's plan to develop a campus in Houston. And they convened a task force to reconsider the scope and size of the system offices. At the last UT System regents meeting of the year, McRaven announced that he plans to step down in the middle of 2018. He said health concerns were the main reason why. McRaven's Houston campus plan failed in part because of passionate opposition from the University of Houston, which saw it as a threat to UH's status as the leading public university in the state's biggest city. It wasn't the only expansion plan that raised hackles in 2017. Texas Tech University secured limited startup funding from the Legislature to pursue a vet school. But A&M, which is currently home to the only vet school in the state, is determined to fight that effort. Meanwhile, some lawmakers have expressed skepticism about universities' designs on opening new medical schools, particularly at UH but also at Sam Houston State University and the University of North Texas. One of the most memorable stories of 2017 nationally will be the number of powerful men brought down by sexual harassment allegations. The avalanche began in October with the downfall of Hollywood mogul Harvey Weinstein. But the University of Texas at San Antonio had its own moment months earlier. In March, longtime UTSA president Ricardo Romo stepped down, saying he had been made aware that the way he embraced women "made them uncomfortable and was inappropriate." Disclosure: Texas A&M University, the University of Texas at Austin, Texas Southern University, the University of North Texas, the Texas A&M University System, the University of Texas System, Baylor University, the University of Houston, Texas Tech University, Sam Houston State University and the University of Texas at San Antonio have been financial supporters of The Texas Tribune. A complete list of Tribune donors and sponsors can be viewed here.